Dr. John Petty believes that every part of your dental experience should be comfortable, which is why he only uses the latest, most state-of-the-art technology in our practice. With it, he can ensure that your care is always quick, precise, and easy. He and the rest of our team work hard to stay on top of the latest advancements in the dental field, so if there is an instrument or machine out there that will improve your time with us, you can trust that we probably already have it! Read on below to learn more about some of our excellent technology. Our intraoral camera will allow you to finally see your smile from your dentist’s point of view. This small, pen-sized device can capture high-resolution images of the teeth and gums we can instantly display on a large chairside monitor. These will make it much easier for our team to catch hard to notice problems, plus you’ll literally gain a whole new perspective on your dental health. You’ll be able to see exactly what we’re talking about and why we might be recommending a certain treatment. X-rays are an essential part of any dental office, as they allow the team to spot problems even before they can be seen by the naked eye. To make this tool even better, we’ve upgraded to only using digital X-rays. 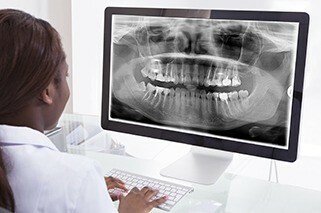 They can create crystal clear images in seconds, and they also expose our patients to 90% LESS radiation compared to traditional dental X-rays. And, the images can be easily sent, stored, and displayed on a nearby monitor for you to look over with our team. Finding and treating tooth decay is one of the most important things we do every day, and thanks to our cavity detection system, this is now easier than ever. This instrument uses a highly-concentrated light to scan the enamel, and with it, we can detect even the smallest signs of decay, ones that would typically be missed during a traditional exam. With this information, we can quickly intervene and stop many cavities from ever forming. Do you or your child feel nervous about visiting the dentist? If so, nitrous oxide can finally take the stress out of your visits. For this, all a patient has to do is breathe in the colorless, odorless gas through a small nasal mask to achieve a feeling of warmth, lightness, and happiness in the dental chair. The mask will stay on for the entire appointment, and once it is removed, the gas’ effects will wear off almost instantly.